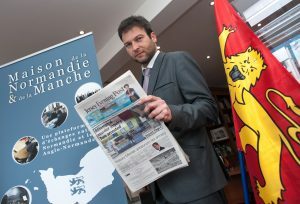 THE INITIATIVE COMES FROM MAISON DE LA NORMANDIE ET DE LA MANCHE IN JERSEY IN PARTNERSHIP WITH THE JERSEY EVENING POST. 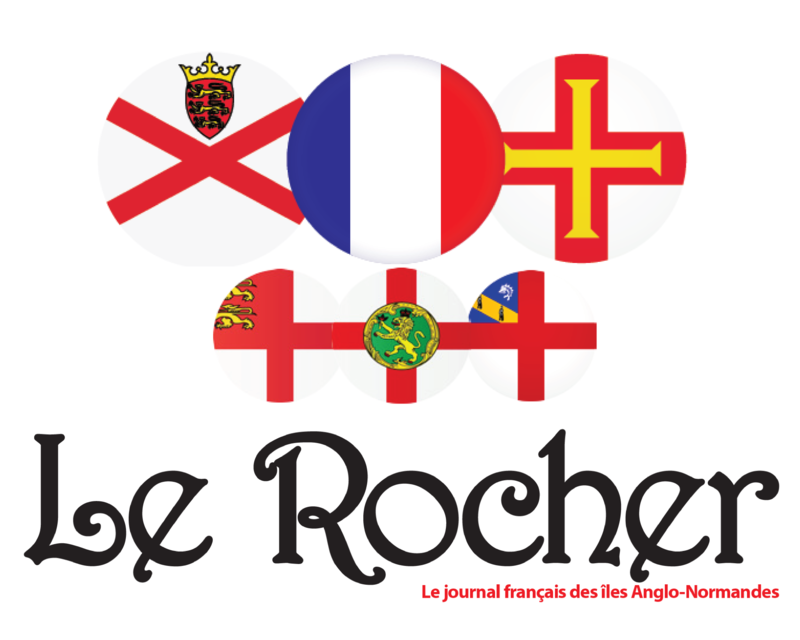 “Le Rocher” is the name of this brand new newspaper which will be edited on a quarterly basis within the JEP. 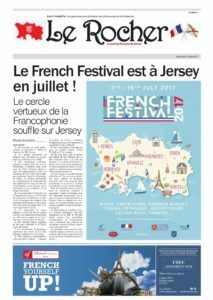 8 pages of articles in French especially made from and for Jersey thanks to a great editorial team both from Jersey and France. 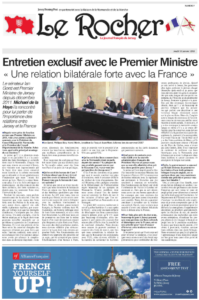 After launching the only chronicle in French in the CI broadcasted every Sunday since January 2016 with the Alliance Française de Jersey on BBC Radio Jersey, I have thought that a newspaper could be complementary. 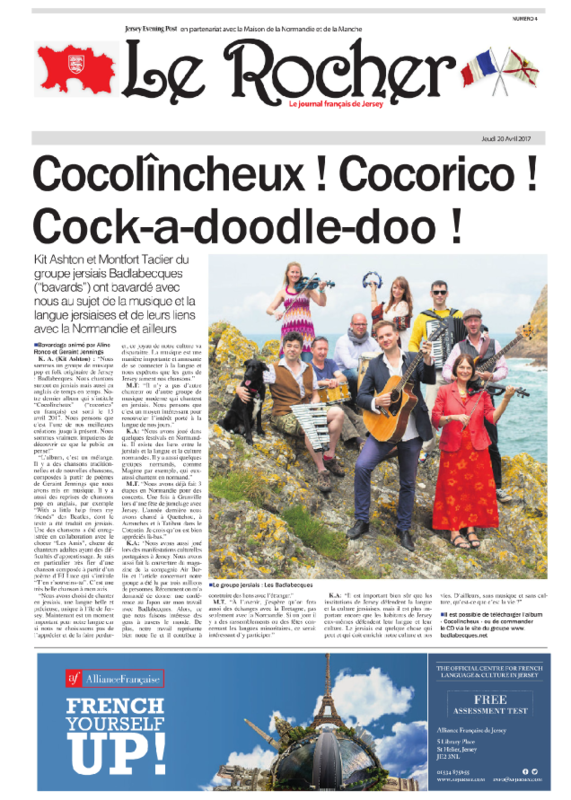 French is another language of Jersey and it is a good opportunity to reinforce this cultural link on the Island. Moreover, the French community in Jersey is about 2,000 people on which we can add at least 15,000 Francophones and Francophiles. Hopefully, French teachers might use it as well as a class material with their students. 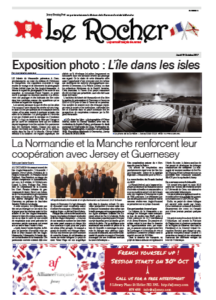 In partnership with the Jersey Evening Post, Xavier Souris, director of Maison de la Normandie is running the French edition of this newspaper in which there are 20 articles written by a dozen people about different topics such as: tourism, culture, Normandy events, twinnings, music, genealogy, Consular information, Words of well-known people from Jersey, Eisteddfod, Alliance Française, Ecole FLAM, Société Jersiaise French Section, interviews, cinema, old French articles from les Chroniques de Jersey etc. “THE JEP is delighted to have enabled this project to get off the ground. 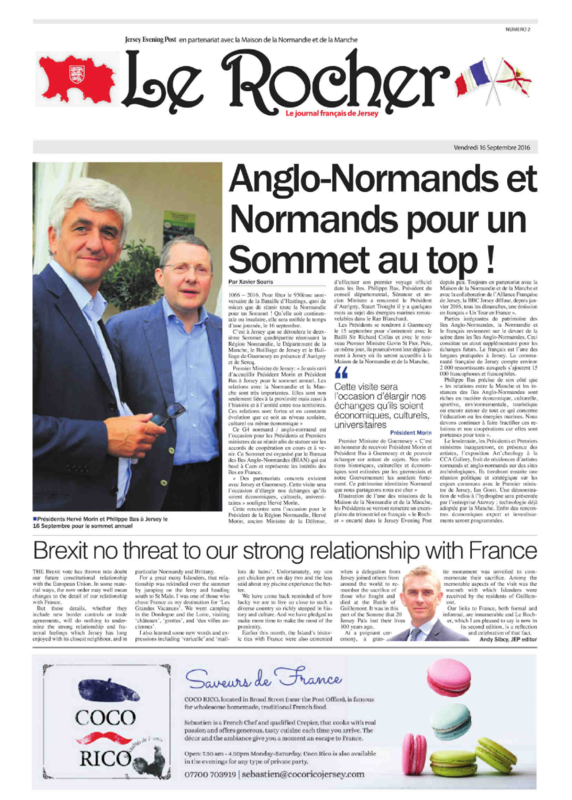 When the Maison de Normandie floated the idea it did not take long to see why it made perfect sense for the Island’s newspaper to become involved. 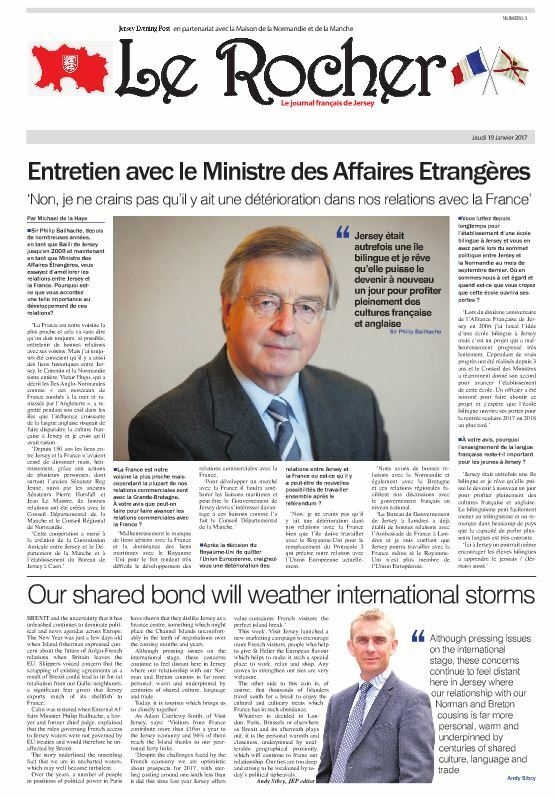 There are more than 2,000 French nationals living in Jersey and many more French speakers, a consequence of our historical, cultural, geographic and economic links with our nearest neighbour. On top of that, the French language is seeing a resurgence in schools. 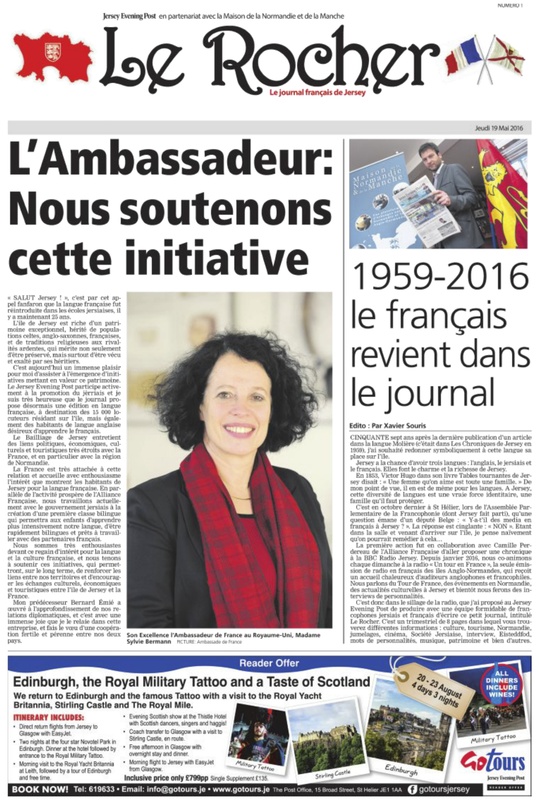 I hope that readers enjoy this new section and that more Francophones will contribute to it in the future.” relates Andy Sibcy, editor of the Jersey Evening Post. Xavier Souris, Directeur de la Maison de la Normandie et de la Manche. “In 1853, Victor Hugo in his book Les Tables tournantes de Jersey said: “A woman we love is a whole family”. I think it is the same about languages. Having in Jersey this diversity with English, French and Jèrriais is a unique identity strength, a family which should be protected. Moreover, I was delighted to offer the first edition of Le Rocher to Her Excellency, Mrs Sylvie Bermann, the Ambassador of France in the UK during her visit on the Island.” said Xavier Souris, the director of Maison de la Normandie.